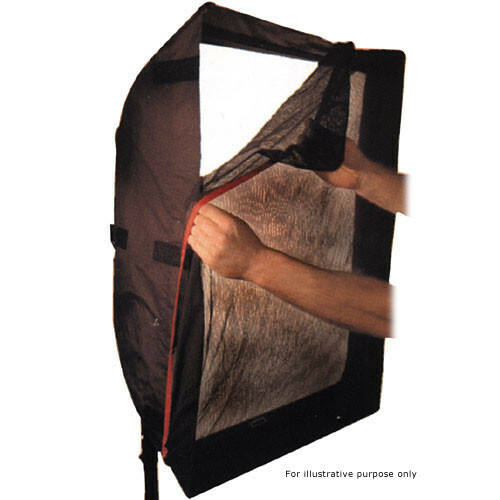 This is a double scrim for a Chimera Small Super Pro, Video Pro Plus or Video Pro Plus 1 softbox, or any other 24 X 32" softbox that accepts a touch fastenered accessory. It diminishes the light emitted by the softbox and light fixture on which it is mounted by one F-Stop. Box Dimensions (LxWxH) 9.5 x 8.5 x 1.0"
Double Scrim - Small is rated 1.0 out of 5 by 1. Rated 1 out of 5 by Anonymous from Astoundingly Overpriced I'm a big time user of Chimera softboxes, but when this scrim arrived I was appalled at how little you got for the price: two panels of black tulle hemmed with a simple cloth strip, with a bit of elastic on each of the corners. And this cost me $$!! I returned it pronto, went down to a local fabric store, and for $1.98, that's a dollar ninety-eight, I purchased some black tulle that does the job just fine. In general, I am offended by how over-priced photography gear is, but this one takes the cake. I can't imagine how this scrim should be priced any more than about $29. Chimera needs to revisit their pricing structure!